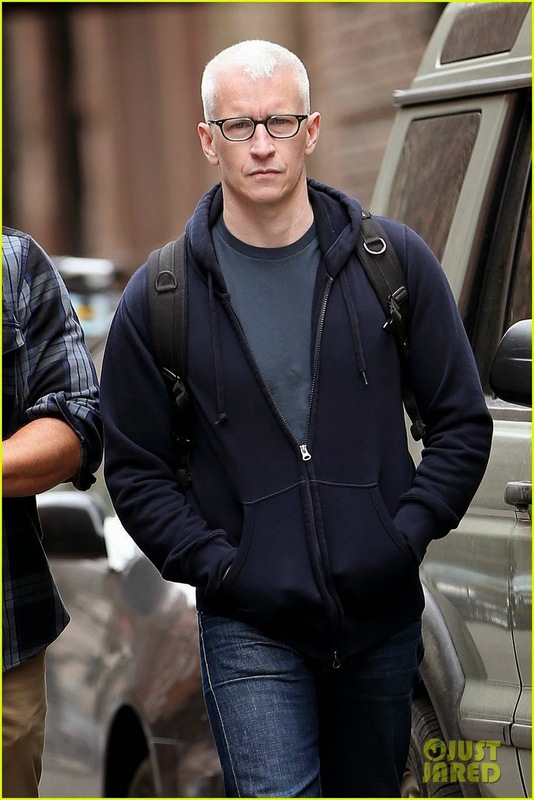 Anderson Cooper steps out with his longtime boyfriend Benjamin Maisani on Tuesday afternoon (April 14) in New York City. The 47-year-old CNN anchor was seen wearing the same Adidas sneakers that Benjamin was wearing! Anderson will be heading to Miami this weekend for a stop on his our with Andy Cohen and he joked about his appearance leading up to the event. “I’ll be easy to spot, I’ll be the only pale guy in #Miami,” Anderson wrote on his Twitter account. I was a minute or two late to Tuesday's 360. A report was already in progress about the Arizona man crashed into by a police car. It seems like we are getting a few of these 'cops behaving badly' reports each week, thanks to the ubiquity of cellphone cameras. However, this incident was caught on two police cars' dash cams. The panel which analyzied this case was made up of Harry Hocks, Dan Bongino and Mark Garages. The second segment was about Robert Bates, the volunteer police deputy who fatally shot Eric Harris instead of tasering him. This kind of mistake is apparently known by the phrase "slip and capture', a horrible euphanism if there ever was one. Randi Kaye had a LIVE! (not really) report on similar cases. Garages, Stinson and Lewinsky discussed these events, the psychology involved and the resulting court cases. Next report was on the seven Georgia teachers convicted of cheating when scoring tests. Martin Savidge had all the info and then Anderson talked to frmer GA Attorney General Michael Bowers. I mostly watched Hayes cover the new rules in Kansas on what welfare benefits can and can't be used for. Filler segment of the night was the report on the baggage handler who fell asleep in an Australian plane's cargo hold and had to shout and pound for help after the plane took off. Gary Tuchman had the report and the re-enactment. This should have been a blurb in the Bulletin. Very late in the show was finally some political news. Brianna Keller reported on Hillary Clinton campaigning in Iowa. Oddly, this segment was not labelled LIVE, not while Keller and Anderson talked about Clinton but when Keller's most obviously taped report began there was the LIVE icon. I have no job experience in television production but I could work the LIVE switch way better than whoever is doing it now. 360 ended with a Bulletin. Because of 'Gotham' I couldn't watch 360 yesterday. Maybe yesterday was when 360 had great big reports on Hillary Clinton, and now Marco Rubio, running for President. Or maybe not? Just Jared can't really be all that surprised that couples sometimes dress alike. Jaanza, what a cute nickname for Mark Geragos! Do you call his kids the little Carports? AC and Ben make a very cute couple. But yeah, I agree that it's not so unusual for a couple to wear the same sneakers. ACK! That was totally unintentional, I wonder if the auto-correct on the computer had anything to do with that. I like GERAGOS a lot (yep, the computer tried to change it to Garages). And now I notice HOUCKS was changed to Hocks. I forgot to mention ATA's photos. Nice pics but Anderson looks a little pissed off. Maybe that's just his natural expression or maybe he didn't want his picture taken. I'm more and more liking how Anderson looks in glasses. Hard to imagine that the Aaron Hernandez trial is so fascinating to viewers that 360 has to devote several segments of the show to it. Glad that he was found guilty for the victim's family's sake, but I never heard of the guy and don't know why his situation has been so prominent on CNN/AC360. It's just not the slightest bit interesting to me and I spent more time watching MSNBC looking for some actual relevant news during 360 since none was to be found there. And I'm so sick of seeing Dan Bongino on the show--it doesn't look as if he's been appointed an official CNN contributor but that may be coming since he's 360 so often. Rachel Maddow had some interesting/disturbing news on how Republicans and their dark money overlords are moving forward with a plan to privatize the VA and how getting the word out to the media about the problems in the VA system was largely orchestrated by these right wing groups who want to get rid of it. Although surveys have shown that the VA gets high marks from vets about the kind of care and treatment it provides to them, the reputation of the organization has been sullied to the point where no one feels comfortable defending it and that has provided an opening for these right wing groups to pounce and try to shut it down. Some of the GOP candidates have gone on record saying they'd like to see the VA privatized and so far Democrats have no response or plan to fight them. THIS is the kind of reporting 360 should be doing instead of pointless sports trial coverage. I suppose the closest they'll come to it is another one of Drew Griffin's predictable "government bad" reports. @Jaanza, it looks to me as if Anderson noticed the paparazzi who was taking their pic and got either annoyed or just tense. It must feel strange to be walking down the street with your partner and be stalked by a photographer like that. Ben seems to be taking it in stride, but AC isn't having it. Well we do know he has a bit of a temper sometimes, lol! I do agree with you about the glasses, I think they look good on Anderson. Wednesday's 360 - A lot of channel surfing during the show, partly because of me and partly because of whoever chooses the program content. I already saw extensive coverage of Doug Hughes, the gyrocopter guy who landed in front of the Capitol to protest lack of campaign finance reform. Hayes was talking about Hillary Clinton's campaign. That same cop, Rozema, was on 360 late in the show during a Sara Sidner report on that crash (this report was labelled LIVE, which gets to be funny when you've seen the same guy LIVE for real on MSNBC). A short while ago, I saw a commercial for tonight's (Thursday's) 360. There will be an *exclusive* interview with the Hernandez trial jurors. Nope. It's being hyped as "must see" but I won't watch that segment. Lol, AC does look a bit mad in those paparazzi pics, I guess he really doesn't like his privacy being invaded. Ben looks a bit more relaxed on the other hand.